Quiches are an excellent and easy, delicious way to clean out your fridge and have a delicious, economical meal! If using a potato or other crust, bake crust (see directions above) while preparing filling ingredients. Saute mushrooms and onion in olive oil in a small skillet over medium heat for a few minutes until mushrooms release their liquid and onions are translucent. Do not discard resulting liquid. In large bowl, beat eggs. Add all other ingredients. Mix. Pour into greased pie plate or prepared pie crust. Bake at 425 degrees for about 10 minutes. Then reduce oven temperature to 350 degrees and bake for an additional 25 to 30 minutes. (Mine was done in 35 minutes.) Let stand for a few minutes before cutting and serving to ensure quiche sets up properly. *I threw my stems into a green smoothie. 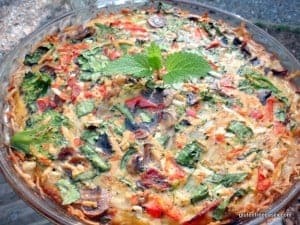 (I always use spinach---stems and all---in my smoothies, but thought they’d detract from this quiche. Still, I didn’t want to waste them. )Using a deep dish pie plate/pan (or even a casserole dish) is always the safest way to go. There's nothing worse than mixing your ingredients and pouring them in only to find out your pie plate is too small. Go big!